Anita Hilty Gossett, 92, a former longtime resident of Carlsbad, New Mexico, passed away Wednesday, April 4, 2018 in Boerne, Texas after a yearlong battle with hip issues. Anita is survived by her daughters, Dana Reese (Rodney) of Boerne, Texas; Joyce Adaire Wehmeyer (Fred) of Lubbock Texas; Dianne Mathis (Tom) of Carlsbad, New Mexico; Lauren Lewis (Francis) of Arlington, Texas. She is also survived by five grandchildren, Scott Wehmeyer, Kim Cavender, Brian Routon, Megan Vickers, and Melissa Anderton, 12 great-grandchildren and two great-great granddaughters. Preceding her in death were her parents, Everett and Clara Hilty, husband, William Adair Gossett, and daughter, Janine Lee Gossett. 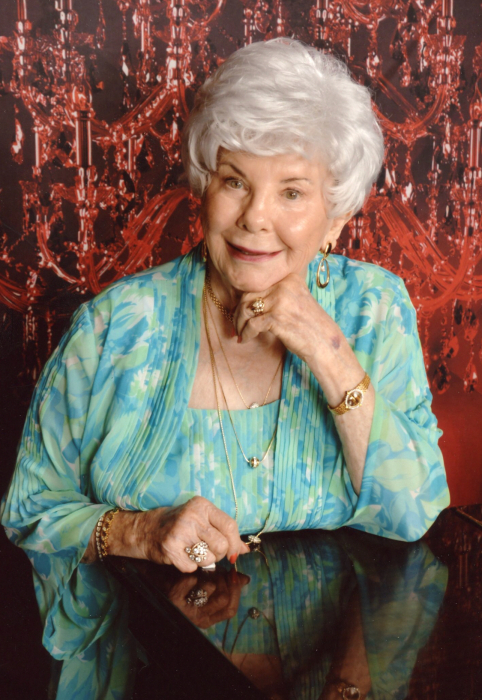 Born on April 25, 1925 in Vandergrift, Pennsylvania, the Hilty Family moved to Phoenix, Arizona, Midland, Texas, and El Paso, Texas, before finally settling in Carlsbad, New Mexico in 1941. Anita graduated from Carlsbad High School in 1943, then attended Texas State College for Women in Denton, Texas. Two years later she returned to Carlsbad to work for her father. Her first marriage to Maurice Nelson ended after 10 years. 3 years later, she met, and subsequently married a local business man, Adair Gossett. Their marriage became a great working partnership that would last 47 years. Together they developed several business ventures, including construction and management of several apartment complexes in Southeastern New Mexico, a travel agency and other businesses. Their dealings took them around the world for work and for pleasure. Traveling became their favorite hobby in later years. Anita was a member of First Presbyterian Church, Daughters of the American Revolution, Assistance League, Eddy County Democratic party and the Chamber of Commerce. After Adair’s passing, Anita moved to Boerne, Texas. In the eight years she resided there, Anita became involved with First Methodist Church and the Omega Health and Wellness Center, where she learned Swedish weaving. She made many friends, especially in the neighborhood where she resided. Anita continued enjoying trips, concerts and musicals in nearby San Antonio. Remaining politically active, Anita switched political parties and was involved with the Republican Women of Texas. However, her profession as “Grandmama” to her grandchildren and “Gigi” to the great-grand children was the best part of her life. Anita Gossett leaves her legacy of tenacity, class and style to her loving family that will always be cherished. A Celebration of Anita’s Life will be held in Carlsbad at the First Presbyterian Church Monday, April 16, 2018 at 10:30 a.m. with Rev. Gene H. Harbaugh officiating. In lieu of flowers, the family requests memorial donations to the Cat’s Meow, 124 S. Canyon Street, Carlsbad, New Mexico 88220.